The original Xbox One was announced over two and a half years ago, but I skipped that version and continued to use an Xbox 360 for my living room entertainment. The new Xbox One S is much smaller and slightly faster than the original, but mostly it is the same. For me this upgrade is perfect timing, as I have been waiting for a hardware refresh before making the switch from the now-discontinued Xbox 360. For people who already have an Xbox One: it may be better to wait for “Project Scorpio” – which will be a significant upgrade to the Xbox coming late 2017. Microsoft have stated that all three iterations of the Xbox One will be compatible with each other – so I am not concerned about being left behind, though “Scorpio” will almost certainly support VR as well. The industrial design of the Xbox One S is absolutely fantastic. Anyone who wasn’t keen on the “VCR” looks of the original Xbox One would agree that Microsoft has gone in a different direction this time. At the moment the device only comes in white, though I know plenty of people would have liked to see it in black. To me the white polycarbonate really shows off the features of design itself – it would be a lot harder to make out some of the nice touches if the device was just black and in the shadows. 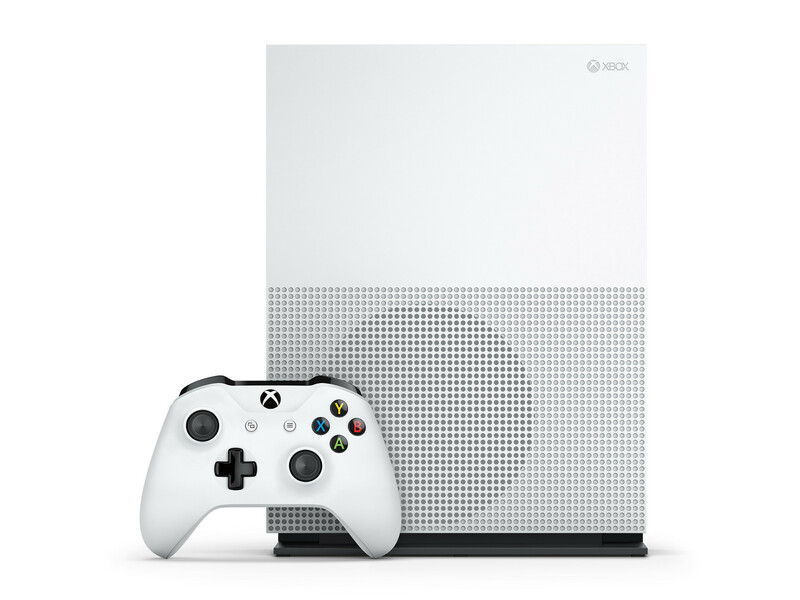 Internally the biggest noticeable improvement is around storage: the disk in the launch edition is 2 TB – that’s four times larger than the disk that shipped with the original Xbox One. You need it too, as games are regularly over 80 GB. The infrared transmitter is now built in to the front of the Xbox One S. This means I can control my TV without the need for the expensive Kinect add-on. But the other two features are not included. I can understand the fact that the camera and motion detection technology is not built in, as most games don’t use it, but I don’t understand why the Xbox One S didn’t include a microphone array by default. Especially as being able to turn on the Xbox with your voice was one of the most impressive features of the Kinect, and the new Cortana assistant requires a microphone to work. If they can include an infrared transmitter, why didn’t they include a microphone array too? I don’t get it. The Xbox One S comes pre-loaded with the “Redstone” version of the operating system which matches the Windows 10 Anniversary Update. It includes features like Xbox 360 backwards compatibly, background music, Windows 10’s Universal apps, Cortana, and loads of other tweaks. This update is available for the previous model too, but for me this is a massive leap from the experience provided by the Xbox 360. On the Xbox 360 there was no way to pause a game and then watch Netflix for a while, the Xbox One’s software allows this with ease, allowing seamless switching between games, live television, and apps without long loading times. Being able to use two apps at the same time is supported, but it isn’t as great as I’d like to be. Some applications don’t support snapping at all, and the interface for snapping unintuitive when compared Windows 10. As a Groove Music user the new background audio features work really well – all of the music from my Music Pass and OneDrive collections are available to stream from the same Universal app that I use on my Surface and my Lumia. While I could access my music through a subpar app on my Xbox 360, I couldn’t multitask at the same time – there was no way I could listen to music on Groove and then go looking for something to watch on Netflix or iPlayer. 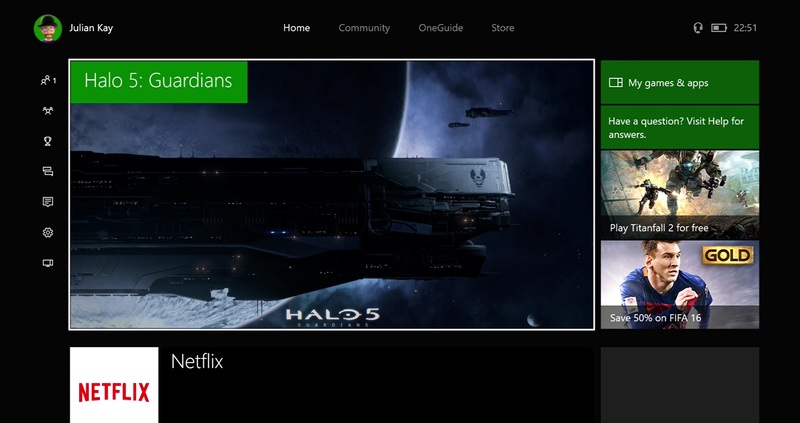 As an entertainment device this makes a lot of sense, and I’m really pleased they’ve added it to the Xbox One. In the UK you can use a USB adapter for the Xbox One to gain access to Freeview. In my area of England this includes over a hundred television channels – including 17 in HD. This works without having to do IR blasting to a cable box, and integrates well with Microsoft’s OneGuide software. I’m not a big television watcher, but now you have to have a TV Licence to watch iPlayer it makes sense to have Freeview as well. 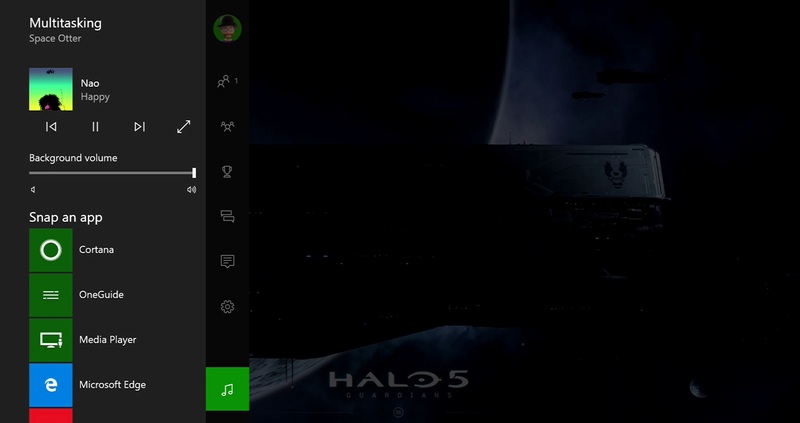 At least this way everything is handled through the Xbox One itself. 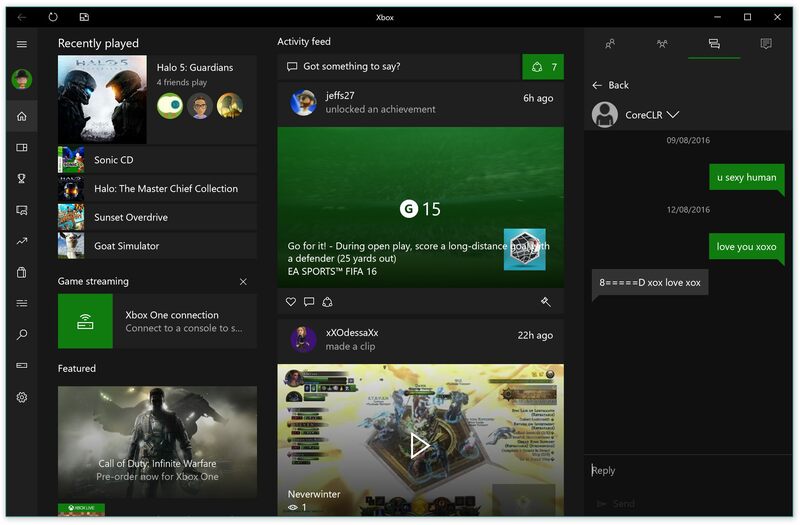 The Xbox app for Windows includes access to all of the Xbox Live features you’d expect. Including friends, messages, achievements, and (most importantly) game streaming. I have been impressed by how well the streaming works – at the medium quality settings there is no noticeable lag, and the compression doesn’t look bad at all. Personally I have no interest in installing 80 GB games directly on my Surface Book (which I use for software development) but having the option of streaming directly from the Xbox One S means that playing in another room is now an option. And yes, streaming even works with the HoloLens. 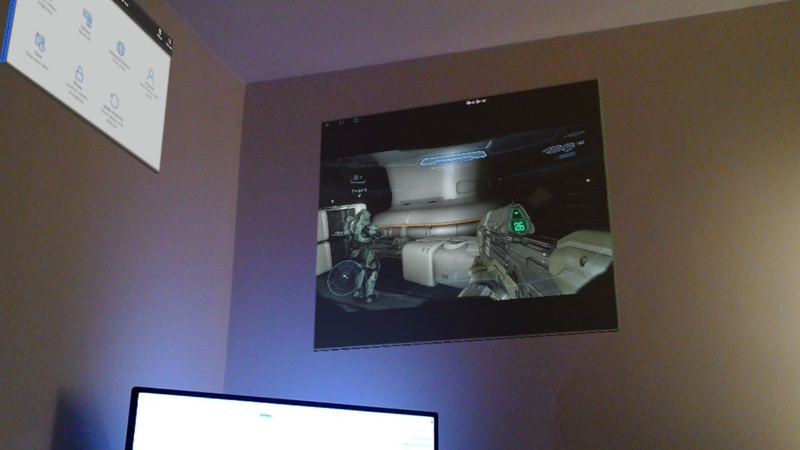 In the photo below you can see me streaming Halo 5: Guardians onto the wall in my office. The Xbox One is still early in its life cycle – especially when you consider how much the Xbox 360 changed in the 10 years it was in the market. I still have more to write around the various options for controlling and using the device, and my thoughts on how the software needs to be improved… but that will come another day. For now I’m pleased to have finally made the jump to the Xbox One platform, and I’m glad I waited for this beautifully designed Xbox One S.